33 ebooks – 1 winner! With the spirit of giving in the air, over 30 Romantic Suspense authors have pitched in to create a single awesome prize! ONE lucky individual will win all the marbles … I mean, e-books! Contest begins December 16 and the winner’s name will be drawn the evening of December 19. Although we’re talking ebooks here, every author contributing to this fantastic prize is multi-published and has been traditionally published in romantic suspense. My contribution is GUARDING SUZANNAH, Book 1 in my Serve and Protect Series. But there are some huge names here! I am honored to be in their company. 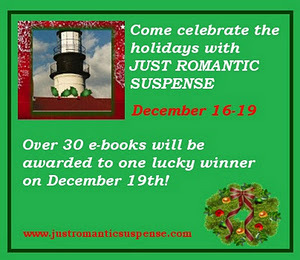 For instructions on how to enter – and to get a gander at the participating authors/prizes – visit the Just Romantic Suspense website.